An image showing Nitin Gadkari and Dr. Harsh Vardhan with their eyes firmly shut during the speech is entirely misleading. Read our factcheck to know why. 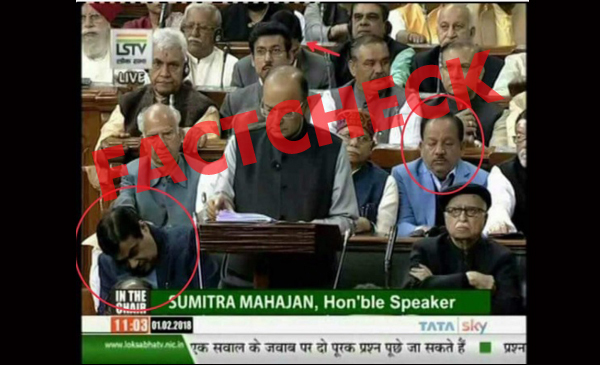 A photograph purporting to show three members of the BJP snoozing during Finance Minister Arun Jaitley’s budget speech on February 1st, is misleading. The still shows two red-circles drawn around union ministers Nitin Gadkari and Dr. Harsh Vardhan. The image was shared by satire Twitter handle ‘Aisi Taisi Democracy’ and filmmaker Rakesh Sharma. BJP ministers show their excitement over the path-breaking Union Budget and FM’s scintillating speech! Your own Union Ministers were caught napping live on National TV. Perhaps even they didn’t find anything worth wasting their time on in Mr. Jaitlie’s rather pedestrian #Budget2018. However, on viewing the video of the entire speech it is clear that neither Nitin Gadkari or Dr. Harsh Vardhan were asleep at the time. The Lok Sabha clock clearly visible in the photo shows the time as 11:03 am. Finance Minister Arun Jaitley was scheduled to deliver the budget at 11 am; which means the screenshot was taken during the first few minutes of Jaitley’s speech. While BOOM could not find @AisiTaisiDemo’s tweet, which seems to have been deleted; Rakesh Sharma apologized and deleted his tweet after BOOM pointed it out. I’m taking down my tweet-comment. At 11:13, @AisiTaisiDemo tweeted this pic in a reply to Minister Kiren Rijiju. At 11:24, I RT-ed (Tweet Photo option), added my comment to it. (See screenshots). I had no reason to doubt authenticity.